With an LOA of 32 metres, Edmond De Rothschild is the largest purpose-built foiling trimaran in the world — and more than double the length of the AC45 racing catamarans that competed at the America's Cup in Bermuda earlier this summer. Speaking after a successful day on the water, Sébastien Josse of Gitana said, “We immediately saw that the boat was keeping her promises: stiff and safe and begging to unleash her power. The first time the boat took off was an incredible moment. We had 15-17 knots of breeze and flat seas, with waves of less than a metre — everything was in place to fly. Aboard the boat there was a mixture of excitement and surprise, as well as pride,” he added. Spire tracks more than 75,000 ships per day now, and continues to build out its satellite and analytics infrastructure. The startup has come a long way since the crowdfunded launch of its first cubesat four years ago. Today, Spire’s constellation numbers 40 cubesats — with more on the way. As its fleet grows, so does its ambition. “Our customers have a diverse set of needs but almost all of them can be served by more and better data served with high reliability,” Kyle Brazil, Spire’s Sense product manager, said in an Aug. 29 statement. It’s doubtful Orbcomm and exactEarth see their in-orbit assets as “aging satellite infrastructure.” Orbcomm’s OG2 satellites launched in 2014 and 2015, and exactEarth’s exactView system is mid-deployment — but Spire has established itself as meaningful competitive player. The U.S. National Geospatial-Intelligence Agency is one of Spire’s customers. 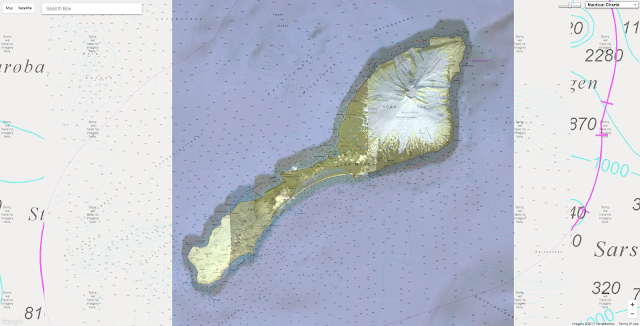 using Geomesa on Amazon Elastic Map Reduce. Spire satellites carry automatic identification system (AIS) sensors for tracking boats and ships, as well as GPS radio-occultation sensors for commercial weather data. More recent satellites include Automatic Dependent Surveillance-Broadcast (ADS-B) sensors for an aircraft-tracking service the company plans to launch later this year. Spire, which began deploying its constellation of weather and maritime data-gathering satellites in earnest in 2015, uses cubesats to compete with Rochelle Park, New Jersey-based Orbcomm, whose 170-kilogram OG2 satellites also carry AIS payloads, and exactEarth, a Canadian company with a first-generation constellation of seven AIS satellites and a second-generation network consisting of AIS hosted payloads launching on Iridium Next’s 860-kilogram satellites. Because of OG2’s unexpectedly high failure rate, Orbcomm is planning a third-generation supplementary satellite system while relying more heavily on partner Inmarsat of London to fill the gaps. Orbcomm said Aug. 3 that its three most recent malfunctioning OG2 satellites are worth roughly $10 million each. Note : Orbcomm did not respond to SpaceNews inquiries by press time. In April, exactEarth received a nearly $2.7 million insurance payout for EV5, an AIS satellite from Fairfax, Virginia-based SpaceQuest that ceased communicating in February. The satellite had launched in November 2013 on a Kosmotras Dnepr rocket. This movie shows one month of AIS plots (20 million plots) as provided by Spire and visually analyzed by a LuciadLightspeed application. The movie shows the vast amount of data instantly visualized, filtered, and analyzed at over 60 FPS on a desktop machine. 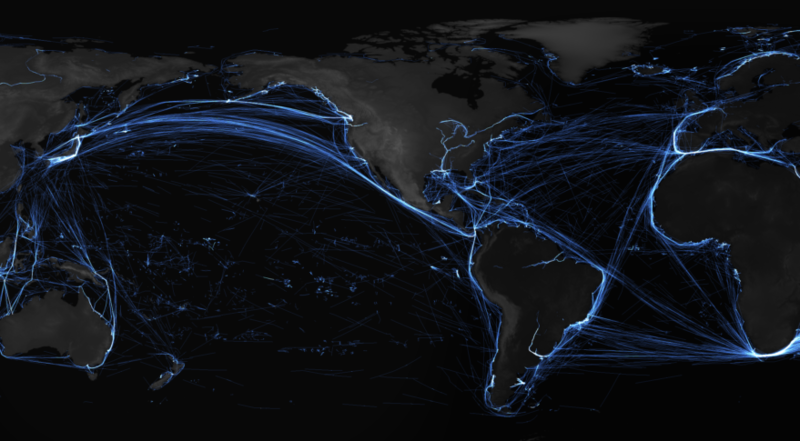 The data consists of a set of terrestrial AIS plots with detailed information in the San Francisco and Los Angeles harbors, conflated with a worldwide coverage of satellite AIS data. The two data sets and the conflation happens on the fly in the model. This meaning that the two files are merged into one model of 20 million plots, where the highlight of a single ship, highlights the tracks of both source data files. Despite that setback, exactEarth has 65 hosted payloads launching on Iridium Next satellites, spokesperson Nicole Schill told SpaceNews Aug. 31. From the two SpaceX Iridium Next launches completed, exactEarth has 13 hosted payloads in orbit, she said, nine of which are in service and four are drifting to their orbital planes. The hosted payload constellation, operated by Harris Corp., will comprise exactEarth’s second-generation constellation. The company has one more first-generation payload awaiting launch on the long-delayed PAZ satellite that investor Hisdesat of Spain recently shifted from Kosmotras to SpaceX. Schill said PAZ is expected to launch in December 2017; Kosmotras was originally to launch the satellite in 2014. “Today the exactEarth/Harris alliance is operating the world’s highest performance satellite AIS system and this capability will get significantly better over the next year as the remainder of the Iridium NEXT constellation is deployed to complete the real-time exactViewRT system,” Peter Mabson, exactEarth CEO, told SpaceNews in an Aug. 30 email. Schill said exactEarth’s total constellation will be over 70 AIS payloads by the end of 2018. Spire spokesperson Nick Allain told SpaceNews Aug. 29 that Spire still intends to field 100 nanosatellites, but can’t give a date for completion due to the unpredictable nature of launch delays. Launch delays will likely decide whether exactEarth or Spire control a larger AIS constellation. Spire had projected in 2015 that by this year the company would operate 100 cubesats. Last month’s Soyuz launch carried eight Spire satellites, one of which was placed in the wrong orbit. “Our satellites now collect data from over 75 thousand unique ships each day,” said Spire CEO Peter Platzer said in an Aug. 29 statement. Spire, exactEarth and Orbcomm have all weathered launch delays that set back their constellation goals by at least a year or more. Schill said the delays to Iridium Next were long enough to afford the company time to add more hosted payloads — the original number was 58, not 65. Spire attributed its ability to launch the new maritime products to new satellites, ground stations and on-orbit upgrades, and said progress on these fronts will continue throughout this year and 2018, along with advancements in machine learning. In addition to the 40 cubesats Spire operates today, Allain said the company has a network of 25 ground stations to downlink data, and is continuing to grow that number as well. departing from Longyearbyen in Norway’s Svalbard archipelago. An international team of rowers ended a record-breaking expedition through the Arctic Ocean on Monday after becoming stranded on a remote Norwegian island partway through their month-and-a-half-long journey. They achieved 11 of 12 expected world records, related to distance traveled and location in the Arctic, before having to call off their mission. Beginning in July 2017, a crew of international rowers carries the coveted Explorer's Club flag on a pioneering two-stage Arctic expedition. 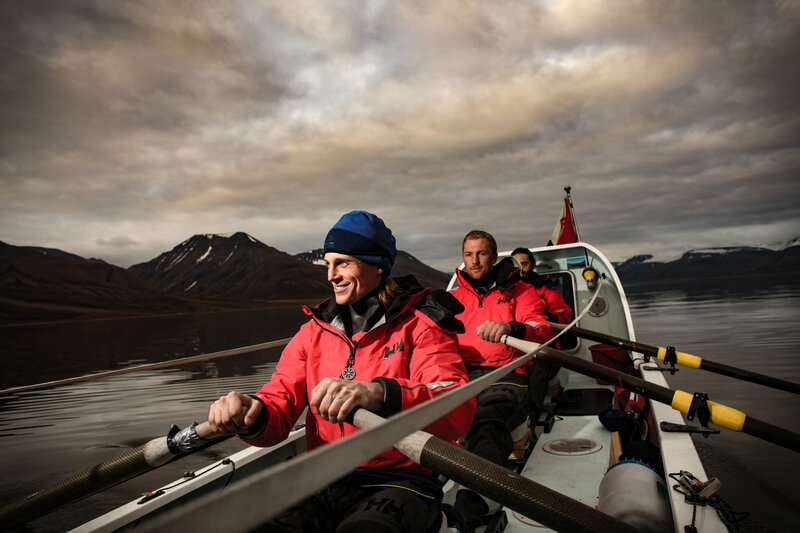 The stage of the expedition departs Tromsø (Norway) for Longyearbyen (Svalbard), and tried to be officially recognized as the first ever South to North row in the Arctic, reaching the northernmost latitude achieved by a rowing crew. The exploratory Polar Row then continued as the crew depart Svalbard to cross 2000km of icy Arctic waters to reach Iceland. 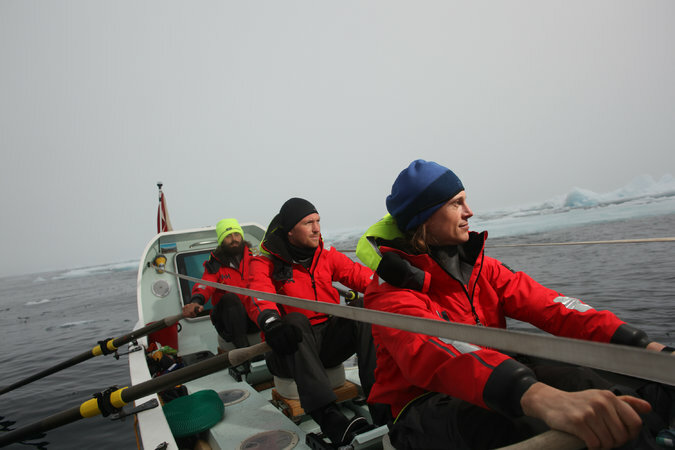 The crew had no sails and no motor to aid them in their quest, and was buffeted by strong and unpredictable Arctic winds (in stark contrast to completely wind dependent lower latitudes' ocean rowing routes). 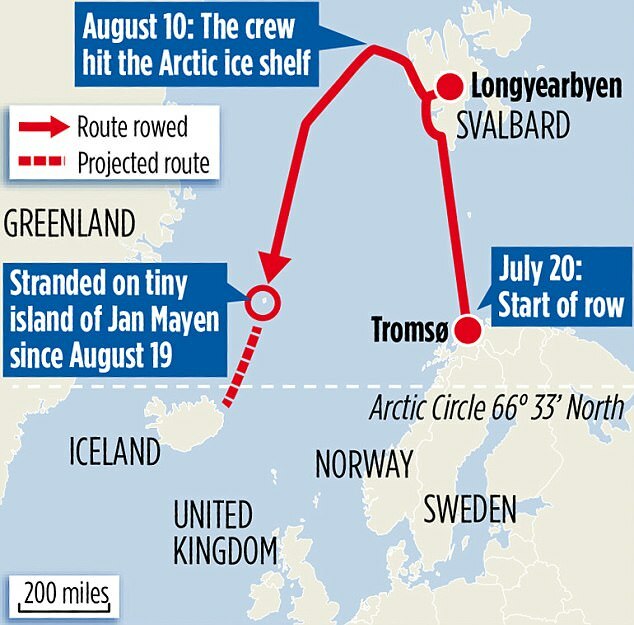 Now, it could be at least another week before the crew of six adventurers, whose expedition was called the Polar Row, is evacuated from the island where they sought refuge on Aug. 19, according to social media posts from its members. 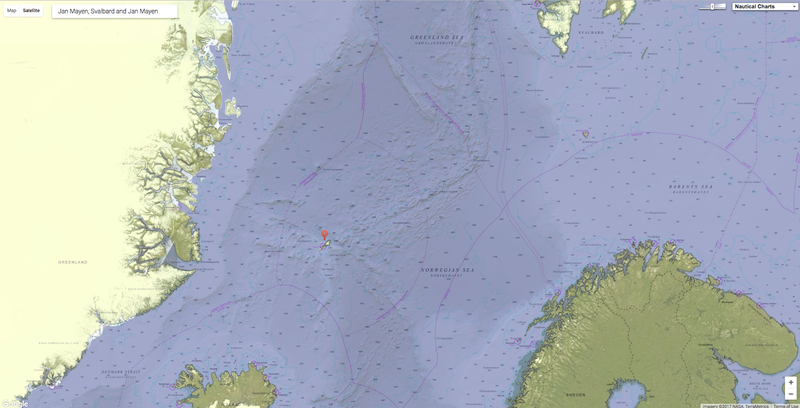 The rowers — from Britain, Iceland, India, Norway and the United States — took to sea from the northern coast of Norway on July 20 and headed north to an island on the Svalbard archipelago. They then continued to the Arctic ice shelf — the first rowing crew recorded as making it that far north — before turning south toward Iceland. But with the skies cloudy for days at a time, the boat’s solar-powered batteries drained, and its electrical equipment shut off. 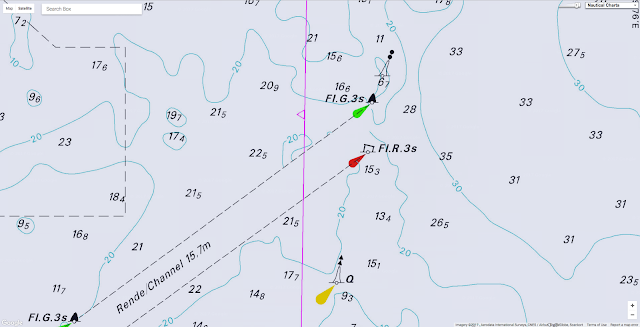 That left the rowers without navigational aids and forced them to rely on manual steering, according to a post on the Polar Row Facebook page that recounted the decision to head for shore. As conditions aboard the 30-foot boat deteriorated, the rowers abandoned their intended course and headed for Jan Mayen island instead. That small volcanic island is about halfway between Norway and Greenland. “I’ve never been so wet and cold for so long,” Alex Gregory, a British rower and two-time Olympic gold medalist, wrote in an Instagram post on Aug. 17, two days before the crew reached land. On Monday, nine days after reaching Jan Mayen, the crew officially ended its journey. Arriving at the Arctic ice shelf. “A successful expedition is also one where everyone goes home safe and in good health to their family and friends,” one of the rowers, Carlo Facchino, wrote on the Polar Row Facebook page. 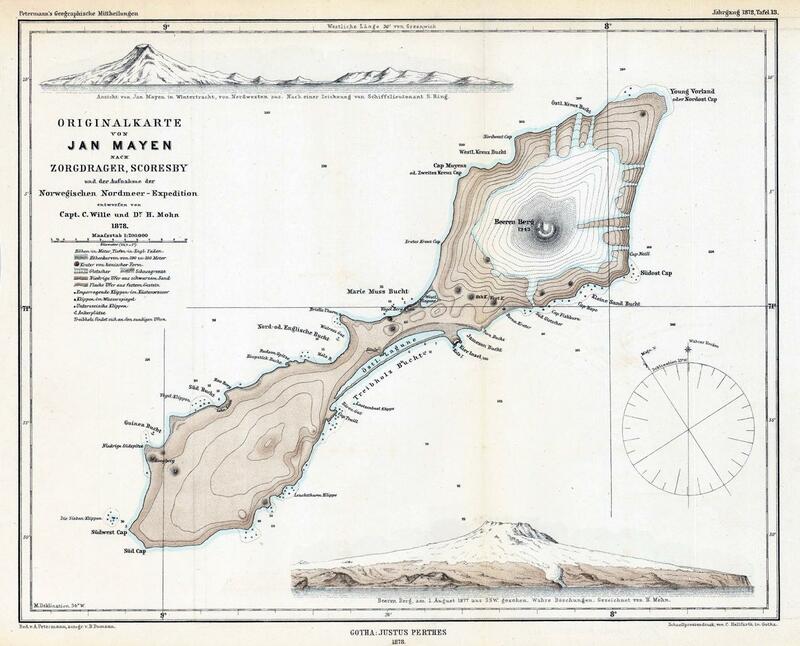 Jan Mayen is not permanently inhabited, but is staffed by around 18 members of the Norwegian Armed Forces and the Norwegian Meteorological Institute who have a base there and welcomed the crew into their facilities. As crew members wait to be evacuated, they have been detailing their journey in social media posts. “The hospitality has been unbelievable — they’ve saved our lives,” Mr. Gregory said in a video posted to his Twitter account. The clip shows a desolate beach strewn with driftwood and whale bones. Private airplanes are not permitted to land on the island, so the rowers are waiting to see when they might be able to return home. “There is news that a boat may be coming past next week that may have space on board for us,” Mr. Gregory wrote in a post on Saturday. The expedition’s captain, Fiann Paul, initially tried to have a fresh crew brought to the island to continue the journey, he said in an email. Flight restrictions on Jan Mayen made that impossible, but Mr. Paul vowed to attempt the Arctic journey again. During the investigation, it was not possible to establish why the chart was to be used only for training and not during the everyday navigation of the ship. 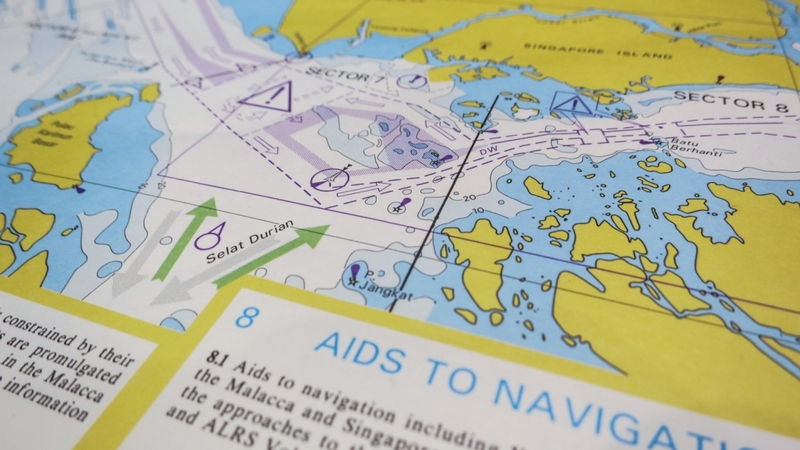 VICTORIA met the mandatory requirement to carry nautical charts and nautical publications in order to plan and display the ship’s route for the intended voyage and to plot and monitor positions throughout the voyage. of an ECS with ARCS to navigate the ship. Apart from the formal intended use of the ECS, there is the question of the ECS’ actual use in the everyday navigation of the ship. On February 10 this year, the Portuguese-flagged container ship Victoria went aground at the entrance to the deepwater channel Lillegrund, Denmark. 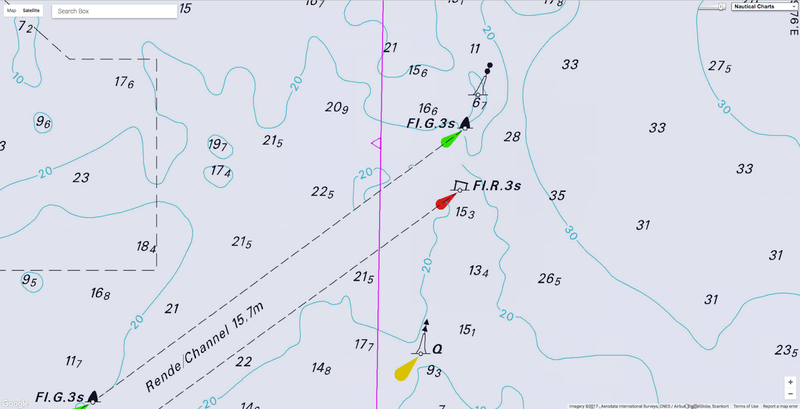 Though the bridge crew were aware of the shallow waters ahead, they were caught by surprise when the grounding occurred as their attention was focused on the turn into the channel. The grounding resulted in serious damage to the ship’s hull and several fuel oil tanks and ballast tanks were ruptured resulting in a minor pollution of the environment. 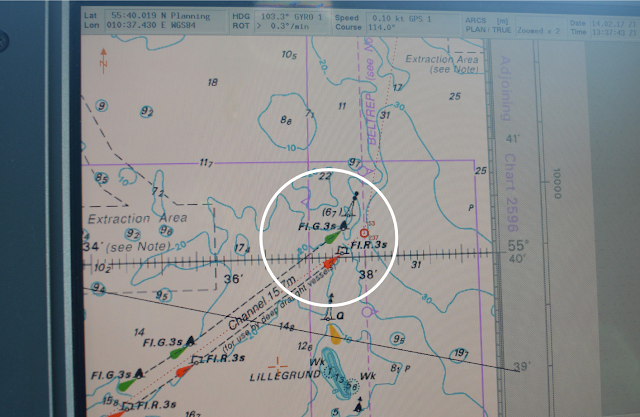 The Danish Maritime Accident Investigation Board (DMAIB) initiated an investigation of the accident and found that the bridge team's priority was, first and foremost, to navigate visually by means of the buoys rather than the paper charts and the electronic chart system (ECS). The position of the isolated danger mark did not warn the crew about the immediate danger of the shallow waters ahead because it was positioned in such a way that it did not direct the ship away from the shallow water area. Photo of ECS screen showing the deepwater channel at Lillegrund. the ship east to avoid the areaTherefore, when the grounding occurred, the crew were caught by surprise and initially did not comprehend what had happened. During the investigation, it was not possible to establish the intended purpose of the ECS. 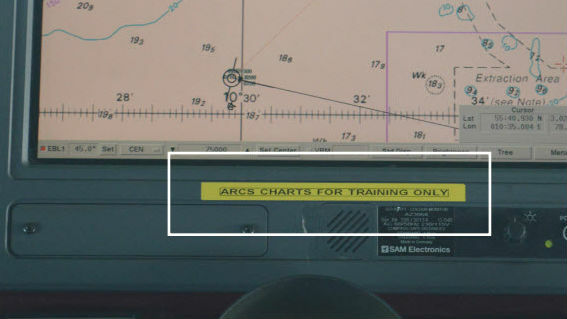 During the investigation, the bridge crew continuously referred to the sticker when asked about the use of the ECS. However, there were some indications that the ECS was to some extent used in daily navigation: It was normally turned on and the ship’s route was loaded into the system, and the ECS was positioned in front of the officer of the watch providing a continuous overview of the ship’s position. An investigation of the paper charts showed that the fixed positions were only sporadically marked in the paper chart, which indicated that the navigational officers primarily used other means of determining the position of the ship, including the ECS. The investigators concluded that the accident illustrates that navigating a ship is a complex interaction between different tasks, e.g. using a passage plan that someone else has made, collision avoidance, fixing the position of the ship, maneuvering, interacting with other crew members, talking to the VTS and getting the ship to its destination on time, etc. As the bridge crew cannot be equally focused on each task simultaneously, a prioritization of tasks will take place. That prioritization is necessary for the bridge crew to make effective task-specific decisions, but can also lead to other information not being recognized. The marine accident report is available here. Critically important fisheries face widespread population declines while fishing pressures continue to increase. Together we must take action towards managing fishing sustainably. More than half of the world’s oceans belong to no one, which often makes their riches ripe for plunder. Now, countries around the world have taken the first step to protect the precious resources of the high seas. “The high seas are the biggest reserve of biodiversity on the planet,” Peter Thomson, the ambassador of Fiji and current president of the United Nations General Assembly, said in an interview after the negotiations. Lofty ambitions, though, are likely to collide with hard-knuckled diplomatic bargaining. 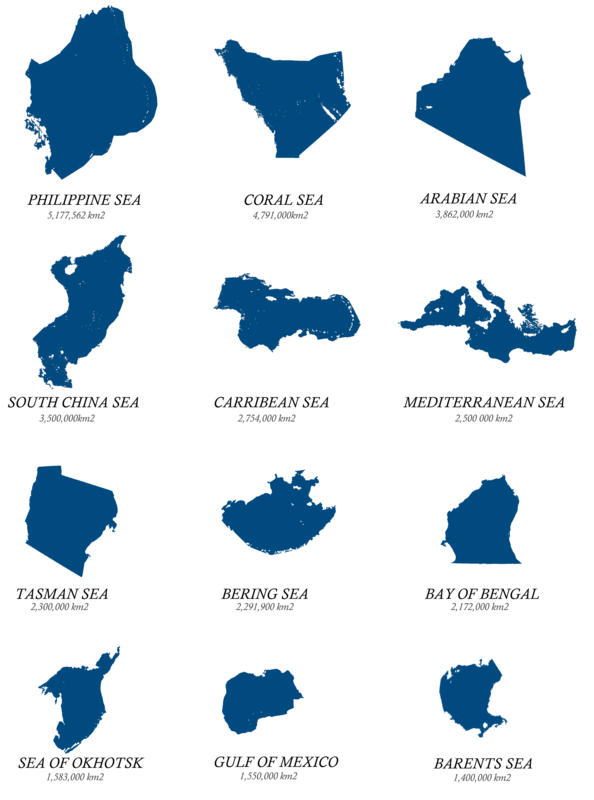 Some countries resist the creation of a new governing body to regulate the high seas, arguing that existing regional organizations and rules are sufficient. The commercial interests are powerful. Russian and Norwegian vessels go to the high seas for krill fishing; Japanese and Chinese vessels go there for tuna. India and China are exploring the seabed in international waters for valuable minerals. Many countries are loath to adopt new rules that would constrain them. And so, the negotiations need to answer critical questions. 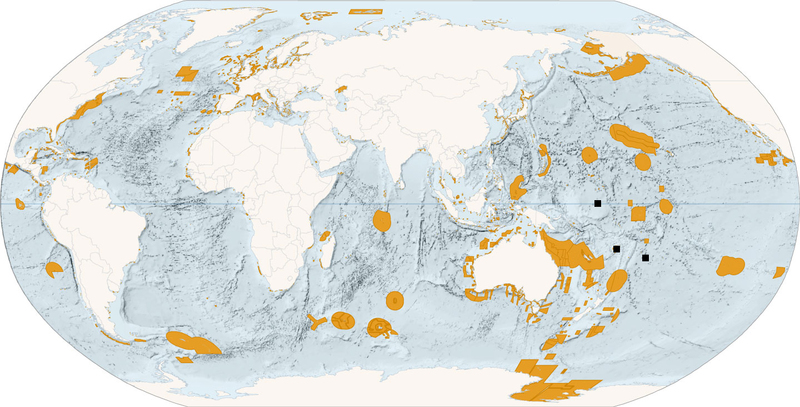 How will marine protected areas be chosen? How much of the ocean will be set aside as sanctuaries? Will extraction of all marine resources be prohibited from those reserves — as so-called no-take areas — or will some human activity be allowed? Not least, how will the new reserve protections be enforced? 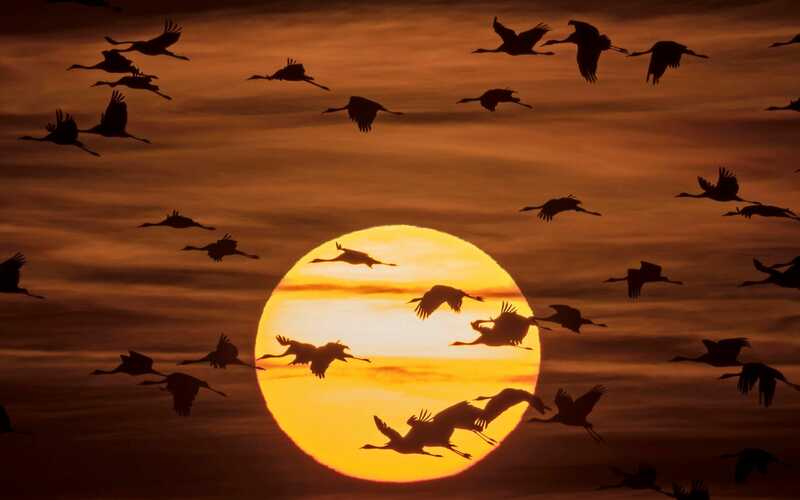 Russia, for instance, objected to using the phrase “long term” conservation efforts in the document that came out of the latest negotiations in July, instead preferring time-bound measures. The Maldives, speaking for island nations, argued that new treaty negotiations were urgent to protect biodiversity. Several countries, especially those that have made deals with their marine neighbors about what is allowed in their shared international waters, want regional fishing management bodies to take the lead in determining marine protected areas on the high seas. Others say a patchwork of regional bodies, usually dominated by powerful countries, is insufficient, because they tend to agree only on the least restrictive standards. The new treaty negotiations could begin as early as 2018. The General Assembly, made up of 193 countries, will ultimately make the decision. A hint of the tough diplomacy that lies ahead came last year over the creation of the world’s largest marine protected area in the international waters of the Ross Sea. Countries that belong to the Commission for the Conservation of Antarctic Marine Living Resources, a regional organization, agreed by consensus to designate a 600,000-square-mile area as a no-fishing zone. It took months of pressure on Moscow, including an intervention by John F. Kerry, then the United States secretary of state. The discussions around marine protected areas on the high seas may also offer the planet a way to guard against some of the effects of global warming. There is growing scientific evidence that creating large, undisturbed sanctuaries can help marine ecosystems and coastal populations cope with climate change effects, like sea-level rise, more intense storms, shifts in the distribution of species and ocean acidification. For over 4000 years fishermen have been catching tuna during their migration through the Mediterranean. During the antiquity they were hailed as the "manna of the oceans". We take a look at the long journey of the tuna to its mating grounds and witness their struggles including massive amounts of hunters and the strong presence of fishing boats. Fishing on the high seas, often with generous government subsidies, is a multibillion-dollar industry, particularly for high-value fish like the Chilean sea bass and bluefin tuna served in luxury restaurants around the world. Ending fishing in some vulnerable parts of the high seas is more likely to affect large, well-financed trawlers. It is less likely to affect fishermen who do not have the resources to venture into the high seas, said Carl Gustaf Lundin, director of the global marine program at the International Union for Conservation of Nature. In fact, Mr. Lundin said, marine reserves could help to restore dwindling fish stocks. High-seas fishing is not nearly as productive as it used to be. “It’s not worth the effort,” he said. Currently, a small but growing portion of the ocean is set aside as reserves. Most of them have been designated by individual countries — the latest is off the coast of the Cook Islands, called Marae Moana — or as in the case of the Ross Sea, by groups of countries. Why is such a treaty necessary? At the moment, a variety of regional agreements and international laws govern what is permitted in international waters. 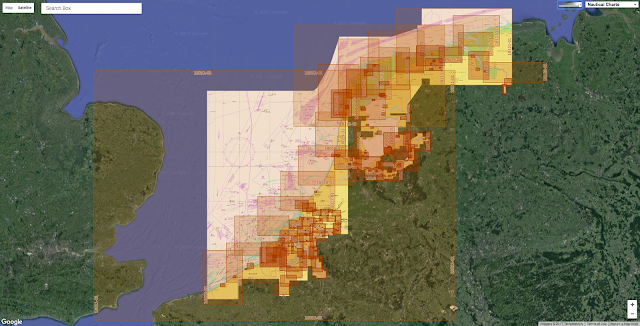 The countries of the North Atlantic must agree, by consensus, on what is allowed in the high seas in their region, for instance, while the International Seabed Authority regulates what is allowed on the seabed in international waters, but not much more. 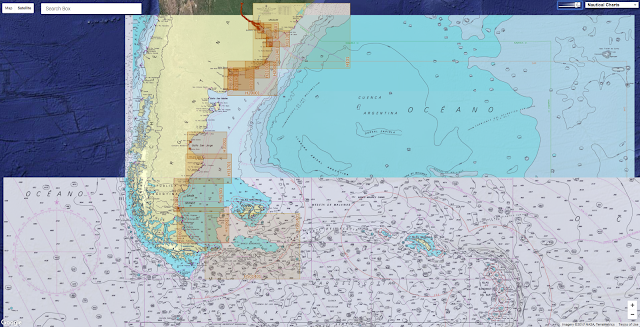 That patchwork, conservationists argue, has left the high seas open to pillage. Pew offers a list of fragile high-seas ecosystems that should be protected. At the top of the list is the Sargasso Sea in the middle of the Atlantic Ocean, which is under increasing pressure from fishing trawlers, Ms. Wilson writes, and home to 100 species of invertebrates, 280 species of fish and 23 types of birds.